Interpreters are normally hired in teams through a conference interpreter provider. Providers specialize in the delicate task of assessing a conference organizer’s needs and putting together a fine-tuned team of professionals to satisfy his/her language and subject requirements, in a cost-effective manner. The role requires a profound knowledge of conference interpreting best practices, and the skills of an expert project manager. Conference interpreters who recruit teams of interpreters are know as consultant Interpreters. Why hire through a consultant interpreter? 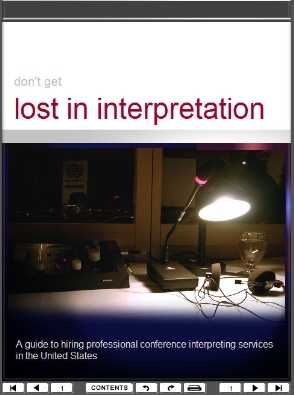 While many businesses provide interpreting services, only consultant interpreters, a few premium simultaneous equipment suppliers, and a handful of language service agencies have the specialized knowledge it takes to be quality conference interpreter providers. Because they themselves are interpreters, consultant interpreters possess first-hand knowledge of the conference situation and can personally vouch for other interpreters’ skills and qualities. No one is better placed to ensure the best possible match between a team of interpreters and the conference organizer.